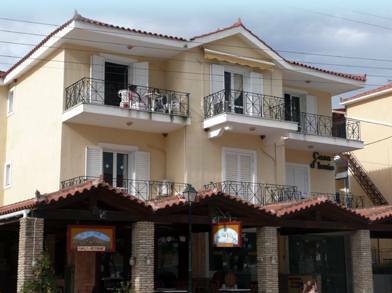 We have just stayed here and were on the first floor overlooking the main street. The appartment itself was fine and kept very clean. It was cleaned every day and clean laundry , including towels twice per week. We were pleased with the accomodation, it was very central and had a lovely view . However ,it was a perfect location until 3 - 4am in the morning when we were awakened every night with noisy motor bikes and scooters racing up the main street when the bars and clubs closed.This was VERY NOISY unless you closed shutters,door and windows. (then it was too hot!!) Advice : take ear plugs for sleeping. We are going to Casa D'Lonio Appts in late September 2004. We would like to know. Do they supply adequate towels for showering or do you need to take your own. Also, Is there a good supply of hot water in the evening? Booked up for Casa DiLonia apts., 2005 any information would be helpful,are they noisy are the balconies big, are they clean. Mnay thanks. You only get so see the front of the appartments in the brochure so we were a bit disappointed when we got a side room (with half the size balcony!) but never the less these studios are clean, tastefully decorated and modern. The central area (about a 2 min walk to the beach and smack bang in the middle of the bars/restaurants) meant that there was a bit of noise til about midnight but nothing excessive. All in all, a good base.